If you received a parking violation from the City of Sycamore, you must either pay the fine or contest the violation within 21 days of issuance. You cannot do both. You may pay your violation in person at the City Clerk’s Office located in the Sycamore Center at 308 W. State Street. Office hours are Monday through Friday from 8:30 AM to 5:00 PM. The City’s Clerk’s office accepts cash or checks. You may make a secure online payment for your parking ticket via GovPayNet. A receipt will be emailed to you. You may mail the violation notice along with a check or money order payable to the City of Sycamore to the address below. Please write the citation number on your check or money order. Do not mail cash. Supporting documents must be received by the police department via e-mail or mail at least one day prior to the hearing date on the citation. You may contest a parking violation by appearing before the hearing officer on the date and time indicated on the front of your citation. Please bring with you any supporting material or evidence needed to contest the violation based on one of the above stated reasons. Failing to respond to this violation may cause a determination of liability to be entered against you. Failing to pay the fine and any penalty due within the time specified may result in the city’s filing a complaint against you in the circuit court to have the unpaid fine or penalty rendered a judgment in accordance with Section 11-208.3(f) of the Illinois Vehicle Code (625 ILCS 5/11-208.3(f)0, as amended. In addition, vehicles located with the city may be impounded for failure to pay fines or penalties for three (3) or more vehicular standing, parking, or compliance regulation violations and/or your driver’s license may be suspended should you fail to pay the fines or penalties for ten (10) or more vehicular standing or parking violations under Section 6-306.5 of Illinois Vehicle Code (625 ILCS 5/6-306.5), as amended. All notices will be mailed to the address of the vehicle’s registered owner as recorded with the Secretary of State. 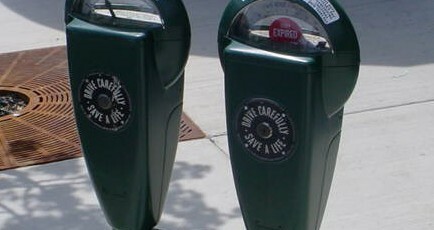 Great effort is made by our parking division to ensure the accuracy of the meters. Please understand that our vintage meters do have mechanical failures from time to time. If you are concerned a parking meter is not functioning properly, please let us know the meter location, meter number, and how the meter if malfunctioning by clicking here and our staff will take appropriate repair steps. For questions regarding hearings, please call 815-895-3435. For questions regarding parking violation payments, please call 815-899-1697.